Since I still had my Santa's Sweet Shoppe images out from my previous day's post, I used them to create today's card, using SC203, my white card opens to reveal this sentiment "Being without you on the holidays really breaks me up", you get the sheet of sentiments FREE when you purchase Santa's Sweet Shoppe. 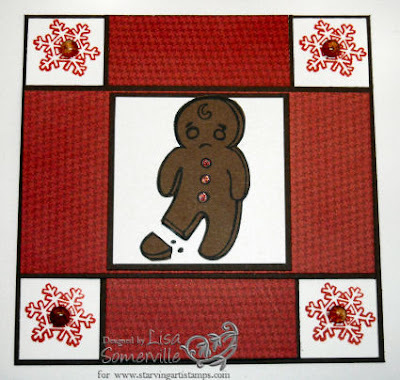 I Paper Pieced the gingerbread boy, by stamping him on my Chocolate Chip DSP, then added some Stickles Glitz in read for his buttons. The paper behind the image is from the Christmas Magic Collection, I layered it on Chocolate Chip card stock, stamped my snowflakes in Riding Hood Red, then added my Dew Drops with some Glossy Accents, and layered my White card stock on a Chocolate Chip panel, and stamped my sentiment on the inside. Be sure to stop by Pat's Blog later today to see her project, as well as links from the other DT Members. Oh, you are so right, luv the layout now....this is so cute and the saying inside.....super! This IS a great layout! Great image too...so funny!